Air transport policies and aircraft manufacturers and operators demand for safer and greener aircraft transport systems as well as reduced development and operating costs, by 20% and 50% in the short and long term, respectively, has resulted in a need for a paradigm shift in aircraft design. The most promising approach to meet these targets is based on improving the global operational aircraft efficiency. To this end, the adoption of high aspect ratio configurations, lighter composites to increase payload, energy efficient propulsion systems, and advanced morphing control surfaces to reduce drag has received considerable attention in the research community. This talk will present some of the research and development in the area of "Unmanned Air Systems: Design, Build, Test and Fly” at the Center for Aerospace Research at the University of Victoria in partnership with OEMs such as Boeing (USA), Embraer (Brazil), and nationally with Qinetiq Training Systems and Bombardier Aerospace. 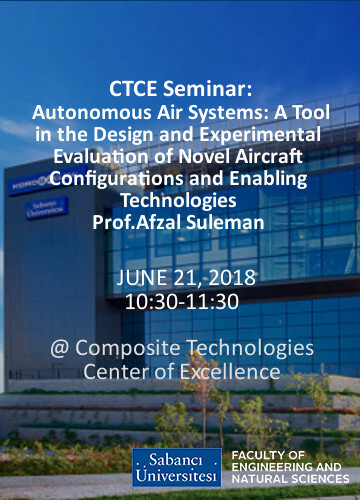 The experimental flight test program aims to improve the performance of complex aerospace engineering systems through advances in mathematical and computational models, and experimental methods that incorporate multidisciplinary analysis and design optimization, and experimental validation and evaluation using autonomous scaled flight test models for the synthesis of novel configurations and related technologies. The design and development of physical flight test platforms provide a low-cost opportunity to evaluate flightworthiness of new and unconventional aircraft configurations. Examples will be used to illustrate the experimental UAV flight test programs for aeroelastic evaluation of joined-wing and high-aspect ratio aircraft configurations. The flight tests will enable designers to retrieve quantifiable data and to provide a qualitative assessment of the aircraft handling qualities. It provides new perspectives that may lead to identification of design issues early in the development process thus avoiding expensive re-designs at the detailed design phase of the full scale transport aircraft. Afzal Suleman, Canada Research Chair (Tier1) and Professor, University of Victoria (2000-Present). Director, UVic Centre for Aerospace Research. Associate VP Research (2009-2010), and Associate Dean Research (2005-2009). BSc (Honours) and MSc in Aeronautical Engineering from Imperial College, U. London, UK. PhD in Space Dynamics (1992) from the University of British Columbia. International Space University, Advanced Space Studies Program, Japan, 1992. National Academy of Sciences/National Research Council Fellow, US Air Force Research Labs (1992-1994). Assistant Professor, Technical University of Lisbon (1995-2000). National Delegate, United Nations Committee on Peaceful Uses of Outer Space (UN-COPUOS) and NATO Research and Technology Organization Applied Vehicle Technology (AVT-RTO). Associate Fellow of the American Institute of Aeronautics and Astronautics, Member of the Canadian Armed Forces Defence Advisory Board. Member of the Canadian Government Space Advisory Board. Fellow Royal Aeronautical Society. Fellow Canadian Academy of Engineers. Fellow of the Royal Academy of Sciences of Lisbon (Portugal). Associate Fellow AIAA (USA). Fellow Canadian Academy of Engineers (Canada). Research and development in the area of Unmanned Air Systems, Aircraft Structures, Aeroelasticity, Aircraft Design and Advanced Composites.